I Have A Store! And Cookies! 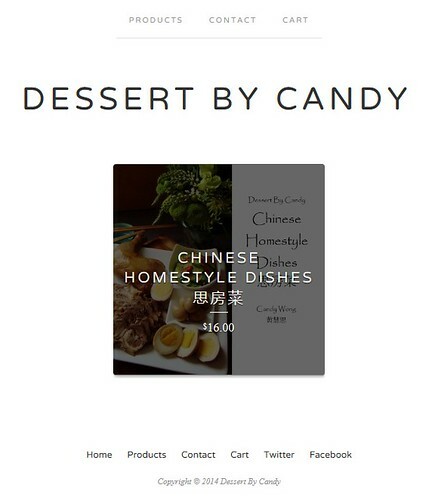 My own online store and a batch of fresh cookies were on my mind the last few weeks. Cookie craving is predictable and the lack of cookies is simply my stubborn refusal to add more junk food to the house. I finally caved and made a batch of Kinako Chocolate Chips Cookies. I love the result and can’t wait to share the recipe with you at the bottom of this post. Another piece of news that I cannot wait to share is the grand opening of my online store! 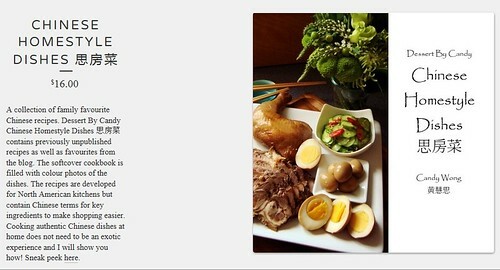 I gave you a preview of my self-published cookbook not too long ago. I ran into a few bumps on the road but now the ordering, printing, and shipping are running like a well-oiled machine. After a bit of number crunching, I’m thrilled that the cookbook is available at $16CAD with free shipping to Canada and the US! I already filled a bunch of orders during the weekend and the books are ready to ship from the printing facility now. Come take a look inside! I’m very proud of my first book with previously unpublished recipes as well as old favourites from the blog. I hope you’ll like it too. 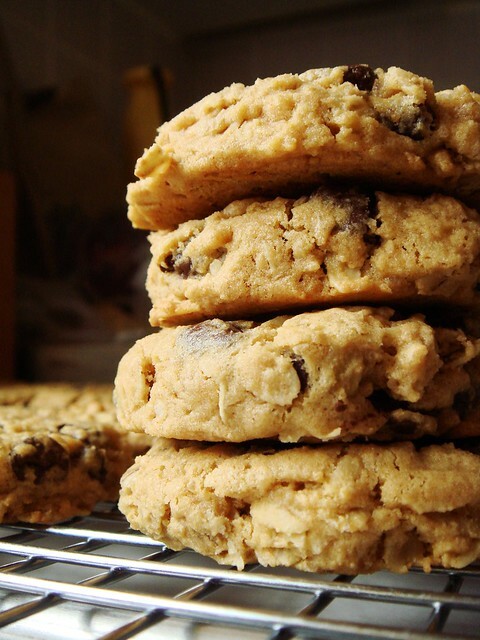 As for cookies, my Kinako Chocolate Chip Cookies are a twist on a tried and true recipe. I fell in love with 101 Cookbooks’ Mesquite Chocolate Chip Cookies ever since I made it the first time (I follow David Lebovitz’s version here). Unfortunate for me, finding mesquite flour in Canada is not easy. I squirrel away small bags every time I travel to Texas and ration them carefully. Mesquite flour contributes plenty of unique flavour to the cookies and it is gluten free. Sounds familiar? Yup, those are qualities that kinako (toasted soy bean flour) share. Did I mention kinako is also significantly cheaper than mesquite flour? Although it is not smoky like mesquite, I love the nuttiness it adds to the cookies. At first bite, I thought of peanut butter cookies but more subtle. The texture is just slightly sandy and chewy. I’m glad to find a wonderful variation to a favourite recipe without breaking the bank. Preheat oven to 375F. Line at least two 11x17 sheet pans with parchment paper. I usually use four to be more efficient. In a large mixing bowl, whisk together dry ingredients including all purpose flour, kinako, baking powder, baking soda, and salt. Cream butter with brown sugar in a stand mixer using the paddle attachment at medium speed for about 3-4 minutes until light and fluffy. Mix in eggs one by one, making sure the batter is smooth between each addition. Mix in vanilla extract too. Add flour mixture to stand mixer bowl all at once and mix on low speed until just combined. 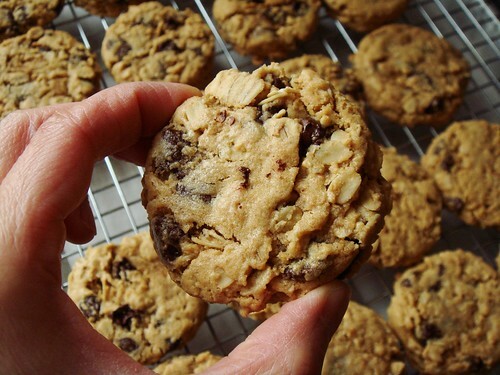 Stir in rolled oats and chocolate chips by hand using a sturdy spatula. Drop batter on prepared baking sheet into balls of about 2 tablespoons in size. I fit 8 cookies per baking sheet. Bake for 11-13 minutes until cookie tops are just set. Cover a flat-bottom small bowl with a square of parchment paper. Flatten hot cookies slightly. 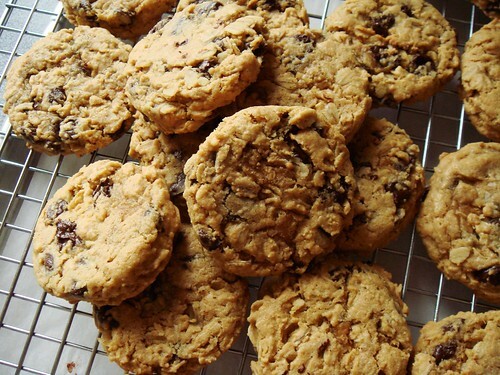 Leave cookies on baking sheet for another 5 minutes before letting them cool on a cooling rack. Repeat with remaining dough. Cookies can be kept in air tight container for 3 days.